Career and Technical Education (CTE) teachers in Charlotte-Mecklenburg Schools are taking the lead in revising North Carolina’s interior design curriculum. 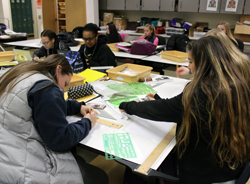 The interior design program is part of CTE’s Family and Consumer Sciences Education, which includes areas such as culinary arts and clothing design. There are four levels of design courses that prepare students for internships, work and college. Robert Pinkston, professional learning community lead for the program, said interior design is very competitive and a college degree is required to practice it. He said most students who finish the program will be almost a year ahead when they get to college and will be fully capable of doing professional-quality work. Representatives from five districts were on the curriculum redesign team, including Pinkston, a CTE teacher at William Amos Hough High. He said the team worked collectively and individually for about six months on the revision. He said the N.C. Department of Public Instruction reviews all courses and interior design was last revised in 2005. The revision is for the first level of interior design instruction. The course is being piloted this year in 19 schools in 12 districts. 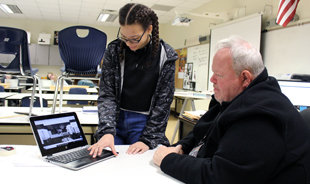 All six CMS schools that offer the design program are participating – David W. Butler, Hough, Myers Park, Rocky River, South Mecklenburg and West Charlotte. The revised curriculum will roll out to the rest of the state in July. Pinkston said this revision will lay the foundation to revise the other design courses. In the level-one course, some of the more generic content has been replaced with new material that focuses on design thinking and the processes behind creativity, which Pinkston said is something that can be learned. He said design is really about function and solving problems and that students who learn the processes to do this are going to be successful in the new workplace. CTE teachers will receive professional development this summer in preparation for the state rollout. Pinkston said not all design teachers have worked in the design industry and there will be skills they must be confident in demonstrating to students. He said they are structuring activities in the curriculum that can be adapted to different teaching styles but will achieve the same outcomes. 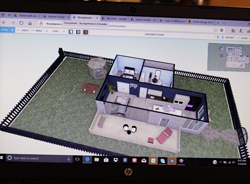 Cynthia Brady, a CTE teacher at Rocky River High, said students will have the advantage of curriculum that has been created with input from interior designers and their real-world experiences with real clients. “Students will be using all the steps of the design process and will be forced to think at the highest level of Bloom’s Taxonomy when they are approaching projects,” Brady said. Pinkston said working on the revision and piloting the new curriculum is not an easy task. It requires using new lesson plans – new everything – as well as a huge amount of planning.